We offer some of the finest wing shooting available anywhere and can offer the discerning wing shooter a champagne experience. 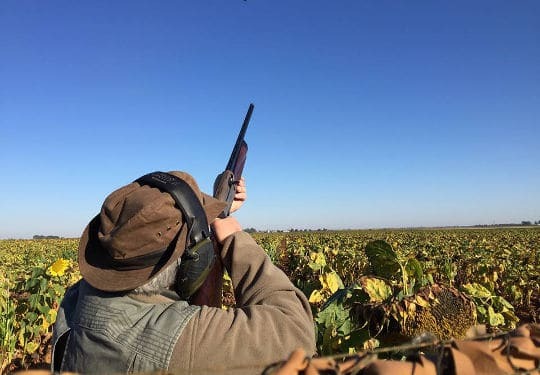 Whether you prefer the high action of low flying incoming pigeon missiles, adrenaline of driven guinea fowl, ducks, geese, greywing partridge over English pointers or the ultimate experience of sand grouse shooting, we can tailor make a package to suit you. The premier sport must however be shooting the rock pigeon or rockies as they are known here. These birds fly in flocks numbering thousands, descending into cultivated fields and intent on wreaking havoc to the farmers crops. Percentage losses of over 50% are commonly experienced and in these tough economic times this is devastating to the farmer and his family. The action is spread out through the day with peaks in the early morning and mid afternoon. Up to 1000 rounds can be fired. 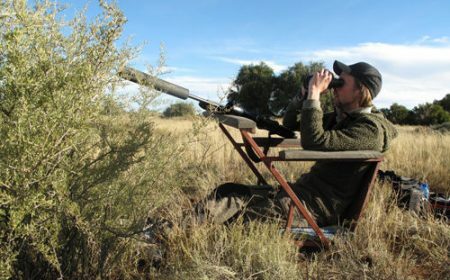 Our experiences cater for either the dedicated wing shooter or the rifle hunter simply needing an afternoon break from hunting plains game. The seasons vary so be sure to mention your interest in wing shooting when making your booking and we will ensure that details are covered. We will supply shells and even guns if required and will ensure that your wing shooting is a memorable one. 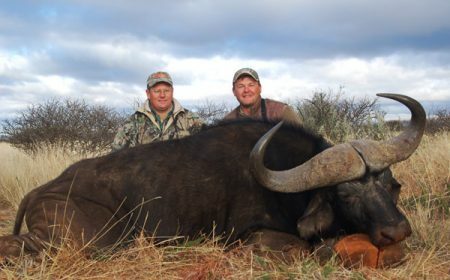 So for your next trip to South Africa, don’t forget your shotgun! A 12g or 20g work well. 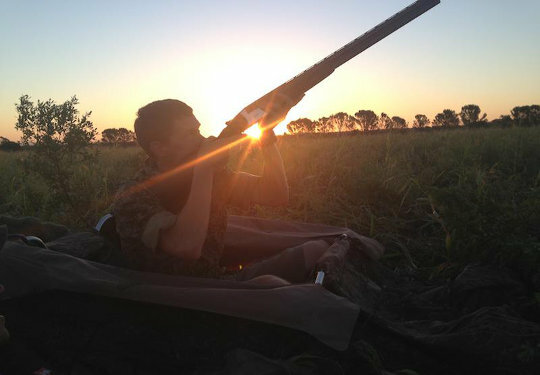 Hunt the Sun caters for all your African wing shooting requirements. Exciting shooting as one of the fastest flying birds come streaking in. The opportunities are numerous and the action fast. Guns are placed in known flight lines in small blinds that are constructed in cultivated Sunflowers or Maize fields. Exciting shooting with opportunities for all levels. Concessions are close not more than a 2 hour drive from the lodge, depending on where the shooting is hot. Driven by beaters to a line of guns, this is adrenaline at its best, shooting is quick, guineas deceptive, good acceleration with fun shooting. A definite wing shooters treat. Tough quick birds, a good days hunting with a fair amount of walking. South Africa boasts a wide variety of ducks. They are shot from blinds or concealed vegetation spots along watercourses and around open water bodies and wetlands. Decoys are used. Species will depend on area and season. Numerous duck species are shot from grass blinds at the edge of ponds and marshes. Yellow bill duck, South African Shelduck, Red Billed Teal and Cape shoveller are amongst the ducks that will form part of the day’s bag. South Africa boasts a wide variety of ducks. They are shot from blinds or concealed vegetation spots along watercourses and around open water bodies and vleis. Decoys are used. Species will depend on area and season. Numerous duck species are shot from grass blinds at the edge of ponds and marshes. Yellow bill duck, South African Shelduck, Red Billed Teal and Cape shoveller are amongst the ducks that will form part of the day’s bag. Namaqua sandgrouse vocalising on route to water is a common sound that echoes across the savannah each morning. They congregate around water at a specified time every morning. The shooting is quick but exhilarating as they descend to water. High mountain reaches, often cold, expect a good days walking while the well trained pointers course to and fro looking for scent. Fast flying, this is a true test of your skill. The covey bursts from under your feet, leaving little time for an adrenaline filled shot. The scenery and views are truely breathtaking. 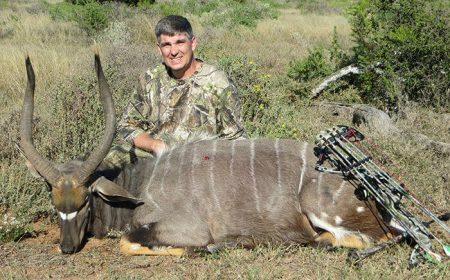 Various types of Francolin, Orange River, Natal Spurfowl, Cape Spurfowl and Swainsons Spurfowl provide excellent shooting.